We’d love your help. Let us know what’s wrong with this preview of Heels Of Fortune by Lynne Russell. To ask other readers questions about Heels Of Fortune, please sign up. The story HEELS OF FORTUNE: PJ Santini Series: Book Two by Lynne Russell is a mystery book that I loved reading. It pulls you in right from the beginning and didn’t let me go until I had read the final page. It has action, danger, romance, and PJ Santini. PJ Santini is a strong, intelligent, independent, and beautiful woman. She is a private investigator and television news reporter. The only thing that is sharper than her skills in these areas is her collection of shoes. She is a shoe fashionista. She has those who help when needed. There is bestie Vicki, Tango Daly, and cousin Sandro. She has her Nonna, her Pop, and her brother, Tony. I enjoyed reading about all of these characters, many of which I remembered from reading the first story. A day with PJ Sanini is never dull and there are situations where you feel like time has sped up and been shot out of a gun. This story has PJ uncovering a shocking truth about her late husband. This has placed her in danger. Will Tango be able to protect PJ as he has before? What does the future hold for PJ Santini? Read this book to find out. There are times when I was turning pages wondering what was going to happen next. This story is best enjoyed with a large glass of wine and a bag of chocolates. Highly recommended reading. First of all, the first PJ Santini book was amazing. It was a one sit read for me. When this book became available, I jumped to one-click it. PJ Santini is a sassy, high-heel loving, novice gumshoe detective, PI and TV reporter. In this latest novel, PJ is investigating the case of her late husband, who she was married to for a very, very, very (you picking up what I’m laying down?) short period of time. Every new piece of information puts PJ in danger but with the help of super hot Tango Daly, her best friend Vicki and her cousin Sandro, she is determined to make it out on the other end of this alive. I loved this book as much as the first and I am so looking forward to what other mischief PJ gets herself into. Highly recommended! 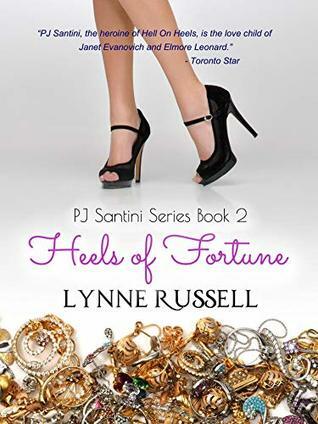 Heels of Fortune is the second book in the PJ Santini Series by Lynne Russell. It is a great second instalment and continues the adventures of PJ Santini. It’s a private eye mystery with a fast pace, danger, suspense, and that somewhat sarcastic sense of humour I loved from the first book. We met PJ Santini in the first book Hell On Heels- she’s a smart, independent, witty, stubborn, and inquisitive television news reporter who moonlights as a private eye. We follow her on her latest investigation as she uncovers some shocking details about her late husband- which brings much danger and threatens her life. As with the first book, there were edge of my seat moments, as well as some seriously funny scenes. I can’t wait to see what PJ gets up to next! Heels of Fortune is the second book in the PJ Santini series and I absolutely loved it! I really enjoyed book 1 in the series but I have to say I thought that this one was even better! I just absolutely love PJ she is such an amazing character to read about! She is full of sass and is so feisty – she gets the job done and she won’t let anyone stand in her way! I loved seeing the characters from the first book back again to help PJ uncover the secrets of her late husband! The pace of the story was great and definitely had me hooked from beginning to end. Heels of Fortune was a fantastic 5 star read and I am really looking forward to reading more from this author again in the future! HEELS OF FORTUNE is book two in the "PJ Santini Series" and I don't think the author suffered a sophomore slump with this installment to the series. PJ Santini is a feisty, independent woman who is multi-faceted. She is a news reporter and a private eye. She has a sense of style and a sense of humor. She's someone I would totally want to be friends with if she were real and wore my shoe size. The story is fast paced, has great supporting characters who help move the story along and maintains its q HEELS OF FORTUNE is book two in the "PJ Santini Series" and I don't think the author suffered a sophomore slump with this installment to the series. The story is fast paced, has great supporting characters who help move the story along and maintains its quirkiness, even as the characters grow. There is a very clear beginning, middle, and end to the story and is well defined. The way it's written holds the reader's attention from beginning to end. After reading the first book, I had decent expectations for the sequel. Lynne Russell didn't disappoint and I was pretty well hooked from the first page. The plot was more evenly paced than the previous book and I didn't feel like there were as many instances of "this was written for a male character and was switched at the last second" but there were a couple where I was thinking if the gratuitous description of PJ's anatomy was entirely necessary. Tango was interesting but I just kept giggling After reading the first book, I had decent expectations for the sequel. Lynne Russell didn't disappoint and I was pretty well hooked from the first page. The plot was more evenly paced than the previous book and I didn't feel like there were as many instances of "this was written for a male character and was switched at the last second" but there were a couple where I was thinking if the gratuitous description of PJ's anatomy was entirely necessary. Tango was interesting but I just kept giggling at his name. Another MUST read from Lynne Russell. Russell can’t just be good at the news...no of course not. She has to also be a powerhouse with a pen. Our heroine, PJ Santini, is so incredibly well written, she feels like my best friend, or the version of myself I wish I had the guts to be. Sassy and snarky, everything is told as it is by our girl. This latest installment in the series is another fast paced escapade with suspense, humor, hi-jinx, and just plain fun. I cannot say enough about this book, th Another MUST read from Lynne Russell. Heels of Fortune by Lynne Russell is the second book in the PJ Santini series. This is a great continuation of the series. PJ is back in fine form. She has gotten information concerning her husband's death and it is not good for her. The information has put her in danger. PJ is fantastic character that is easy to relate and fun and feisty. She gets herself in situations but is smart enough to figure out what needs to be done or to get help from PI Tango Daly. I really have enjoyed this series. I Heels of Fortune by Lynne Russell is the second book in the PJ Santini series. This is a great continuation of the series. PJ is back in fine form. She has gotten information concerning her husband's death and it is not good for her. The information has put her in danger. This is the second book in this author’s series, I loved it just as much as the first. PJ doesn’t want much in life just to be loved, protected, feel fulfilled by her detective and reporting work. But when she finds out the true about her husband’s death, will it put her danger in more than one way? There are alot of great characters and supportive to PJ who still remains my favorite. They bring the story to life and kept me reading until the last page. A must read book and series. This one is a quick read with all the amazing characters from Hell on Heels! Along with the added benefit of a few new colorful characters. This had me laughing and smiling while reading. In fact I didn’t put this down and read it in one fail swoop. I really enjoy reading about PJ’s antics and love her time with the men in her life. Not to mention her lovely parents and wonderful grandmother. This is the second book In this series and honestly I can see it continuing for a while. Limited only to imagination. Well done and I look forward to more in this series. PS. That Daly is one H-O-T guy! This is the kind of book that grabs your attention from the very beginning and doesn’t let you go until you have finished the last page. This is fast-paced and will have you turning pages to find out what going to happen next. PJ Santini, is thirty-something and trying not to think about it, she’s a TV news reporter and marginally successful private eye, and on a wild ride between men, her certifiable Sicilian family, and insufficient funds notices. This time around PJ uncovers the shocking truth about her late husband, a secret that places her in grave danger. She is also in danger of placing her trust in the wrong man, danger of an actual terrifying end to her life. Fortunately, she's armed with a good family, decent common sense, and a spectacular set of 38 DD's. With bad people after her, she decides she wants to investigate this secret and get to the bottom of this with the help of her friends Tango Daly (a fellow reporter), her very best friend Vicki and her cousin San. Can PJ find the answers she is looking for before the bad guys get her? Will she like the answers? What was her husband’s secret? You will need to read this story/series…. This is a great read and I highly recommend it….